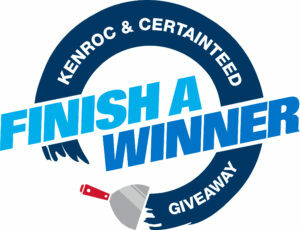 The grand prize winner of Finish a Winner – a promotion by Kenroc and CertainTeed – has been chosen! Brendan Moore with Sean O’Toole, Territory Manager with CertainTeed (left), and Dave Vitkauskas, General Manager of Kenroc Victoria (right). 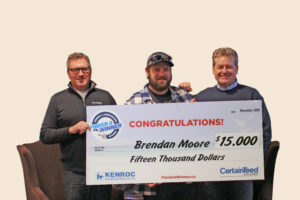 Brendan Moore, a customer of Kenroc Victoria, was selected as the winner. Brendan chose the cash prize. He was presented his prize at a lunch organized for him and his crew on Wednesday, Nov. 28 in Victoria. Finish a Winner ran in all Kenroc branches across Western Canada from April 10 to October 31. Those who purchased qualifying finishing products received a ballot for every $200 spent. Seven of those were monthly winners of Milwaukee Prize Packs or Kenroc gift certificates. Congratulations to Brendan Moore and all the winners of Finish a Winner!